It's been a while, hasn't it? I've been keeping busy and doing the whole work grind thing. But I've also been shopping. ALWAYS doing that, haha. 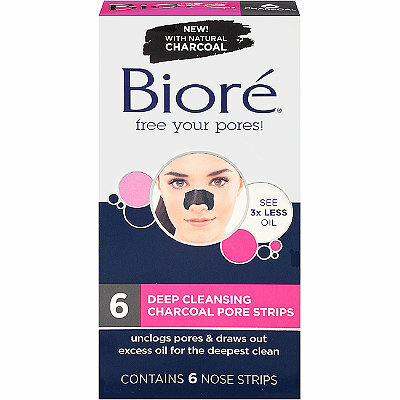 In my journey through whatever store catches my fancy for the day, I was perusing the face cleanser aisle and found these charcoal strips by Biore. I don't know if I've mentioned this before, but I have blackheads on my nose like nobodies business. They've always been there and honestly, I didn't even know what they were until I was about eighteen. Talk about letting your skin go. I decided why not try it? The scrubs I've been using haven't really given me amazing results, though they do make my skin feel loved. This was basically helping me double up on the blackhead war. Now, let me tell you... I didn't think these things were going to hurt. Whoops. Don't rip these off like band aids! Anyway, the first night I tried one of these, I was amazed. I didn't think it was going to literally RIP my blackheads out. If I had known that I would have gotten them a lot sooner! Long story short, everyone should try these, even the normal ones. My pores have never felt so nice. Do you use pore strips and which ones would you recommend?